In the world of science, ever so often we come across visionaries, ‘magicians’ in the words of Bethe, who dare to perceive the world in ways no one else has before. Darshana L Weerawarne is one of them. 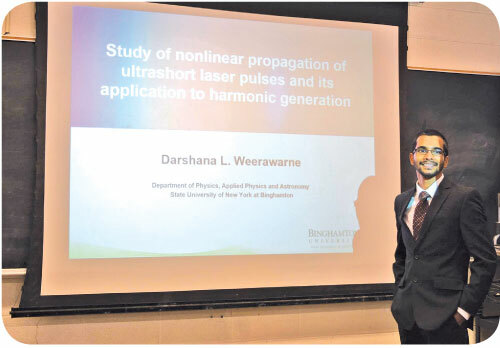 The 31 year old youth is the first Sri Lankan student of the Binghamton Physics Department of the New York State University to follow a PHD in how laser light interacts with matter and the use of laser light to capture and visualize ultrafast [femtosecond] time dynamics such as molecular rotation and chemical reactions that even the sophisticated electronics camera systems cannot resolve. An old boy of Maurapada National School, Mawanella, and Dharmaraja College, Kandy, Darshana has a number of noteworthy accolades to his name. He was the first student of Maurapada National School to get 10 As at the G C E Ordinary Level examination. After graduating from Colombo University he worked as an instructor in physics in the Department of Physics for a short spell before becoming a visiting lecturer in electronics and a research assistant for the Sustainable Computing Research (SCORE) group of UCSC lead by Dr. Kasun De Zoysa and Dr. Chamath Keppitiyagama.They were working on a project that aimed to develop smart home systems in collaboration with Orange Electric Sri Lanka. They had all the expertise in wireless sensor networks but not someone with the background in electronics. This was when Darshana stepped in. “The goal of the project was to design and develop a smart home system, including software and hardware, to remotely monitor the power usage of a house and control the switches and other connected appliances through a mobile phone or a web interface. The system consisted of a network of tiny sensors. Each sensor was equipped with a set of electronic sensors such as temperature, humidity, electrical power, etc, and an electrical switching module. The sensors could talk to one another, to a smartphone, or to a web interface. The users could monitor the power usage of the devices connected to the network and switch on/off the connected devices. They didn’t have to be near the devices to control. The user could monitor and control their devices even from their work even when they are not at their homes. This is well before we had any commercial smart home systems, at least in Sri Lanka. This system inherited a unique feature from SCORE lab’s prior research project called TikiriDB; a sensor network programming interface which treats the entire sensor network as a database. An individual who is very new to sensor network programming can easily communicate with the sensor network if he or she knows how to send and receive data from a database. We named our smart home system TikiriPower because it used TikiriDB. We published this work in Advances in ICT for Emerging Regions (ICTer), 2012 International Conference,” Darshana explained adding that apart from Orange Electric Sri Lanka many other providers such as Dialog, Mobitel, etc have now started popularizing the smart home concept in Sri Lanka . Though no one from his immediate family has taken to physics, some of Darshana’s relatives have followed mathematics for their G C E A/L examinations. Since they have made it into the engineering profession Darshana’s parents too wanted him to follow their footsteps. “Fortunately for me (but unfortunately for my parents), my advanced level examination results were not high enough for me to get in to engineering. Of course, I could have tried a second or third time. I also got a Sri Lankan government scholarship (through the ministry of higher education) to follow engineering in India. However, the choice of becoming an engineer vs a physicist was not easy. 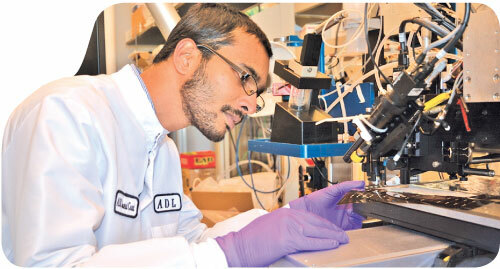 I had to try very hard to convince others why they should let me do physical sciences rather than engineering,” he said. He says that choosing maths for advanced level was self-driven, most probably because he thought that he was good at the subject. However choosing physics had a special reason. “I was always fascinated with optics and light. As a little kid I was very curious about the fact that my Optometrist was able to put a set of lenses onto my eyes and tell if I could see clearly or not just by shining a light onto my eyes. Now I know that she was using a retinoscope to shine light into my eyes and observe the reflection off the retina. But as a kid, it was magic to me,” he recalled. Darshana says that the society embodies a misconception that the eventual fate of advanced level maths students should be is to end up as engineers. “Even today when I talk to young students in Sri Lanka about their choice of engineering vs physical sciences, they beat me with their extraordinarily demotivated attitudes towards physical sciences. They think that if someone follows physical sciences, the only profession he or she can get into is teaching in a high school. If you work hard, you can teach physics to engineers. But, to be honest, choosing physical sciences is a risk. Not everyone can finish their education with a PhD in Physics. But it is a risk worth taking. There are many resources for students in physical sciences. There are even Sri Lankan student groups in other countries focused on helping Sri Lankans pursue degrees in science and other disciplines. I know from my personal experience that foreign universities are eager to take in more Sri Lankan students. Sri Lanka is among the top 20 countries by the number of United States PhD recipients according to National Science Foundation (NSF) survey of earned doctorates,” he stressed. He notes that every physical phenomenon has some governing physics behind it. It can be a simple rainbow, or it can be a complex earth centered satellite. “Once you learn physics, you learn to see the fascinating details of even the simple things you encounter in nature. I think the same goes with most of the sciences,” Darshana added. The fastest traveling thing on earth is light. Light can travel 7.5 time around the earth in one second. Therefore, even the most sophisticated electronic camera system cannot resolve the dynamics of light. “In my field of research, there is a unique technique that we can use to see dancing molecules and bouncing light. It’s amazing to see how simple techniques can give you interesting information about unseen science,” he enthused. He says that laser science involves working with man-made instruments like lasers. Sometimes they work, but sometimes they don’t. “When the laser works, it might take one hour to finish your experiment or one week. Either way, you should be ready to stand for hours in front of a laser performing experiments. You might have to repeat the experiment multiple times. Simply, you should be hardworking and dedicated,” he noted on what it takes to excel in the field. The biggest challenge he has come across involved balancing work and his personal life during his PhD years. “This is relevant especially for those who are engaged in experimental sciences. Once the experiment starts they cannot go home until the experiment is done. Therefore, the priority always goes to the experiment. We must be very careful because the experiment can be redone, but the life cannot be reversed or repeated,” he opined. Seeing the most fundamental physics he has learnt, applied to real life, making a positive impact in the society around him motivates him. He is also passionate about working with children who do not have access to educational resources, especially science. 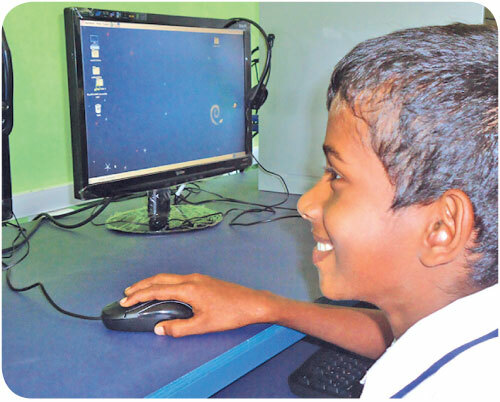 “The SCORE team at UCSC deployed a low-cost computer system called Pokuru PC developed by former members of the team in one of the rural schools in the Ampara district in 2011. This was a group effort lead by Dr. Kasun De Zoysa of UCSC. The computer uses one PC but can simultaneously be used by four users. It was heart-whelming to see how these little kids adapted to the new technology. It was the first time they ever saw a computer, but they managed to figure out how it works,” he added with a smile. He was also involved in Promise Zone, a University-community effort to create improved learning environments for school children in high-needs communities from 2014 to2017. His part was to prepare and conduct science activities based on different concepts of physics for children in grandparent headed families and children from economically disadvantaged families. Darshana loves applying the physics he has learnt to find solutions to real life problems. “With the development of new technology there are millions of simple ways to contribute to the society. Google Crowdsource; an application introduced by google to improve the quality of free google services such as google translate, google maps, google search, is once such way I find interesting. Being a Sri Lankan, it is very interesting that I can contribute to the Sinhala language by handwriting recognition, translation, and translation validation. I used to be one of the handful of top level contributors. Now I see more people, especially young Sri Lankans, contributing more,” Darshana said. Born and raised in Mawanella, Darshana resides in Vestal, New York, USA today. He works as a postdoctoral fellow at Center for Advanced Microelectronics Manufacturing (CAMM) of Binghamton University with Prof. Mark D. Poliks. His work focuses on printing and laser processing of flexible and wearable electronic devices. 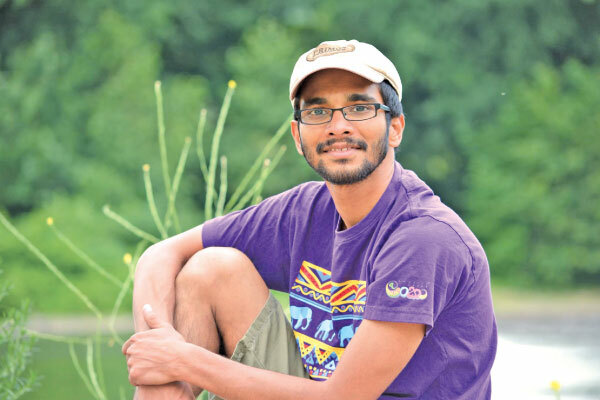 His ambition is to become a physicist whose science can serve the people in need. “Physics is not just what you learnt in your textbooks. It is what you see in every physical phenomenon that happens around you. If you are curious enough to question why a raindrop has the shape of a bun not a teardrop, physics is for you. Try to relate the physics you learn to what surrounds you,” are his words of wisdom for youth who wish to pursue physics. 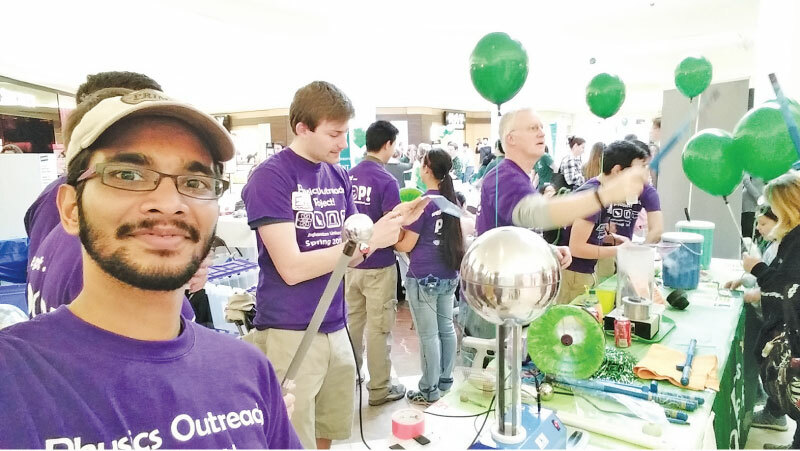 During the Physics Outreach Program 2016 in Vestal, New York.